Today’s post is all about keeping it simple. Sometimes it can feel like a daunting task to keep up with all of the interior design trends. But a lot of times, the easiest ways to refresh your interior come from some basic (we’re talking Decorating 101 stuff here…) design ideas. Maybe you’re implementing them right now, and …. maybe you’re not. Regardless, I think it’s always good to take a refresher course every now and again. So, today’s T&T is all about 10 simple design tips for helping your interior look fab! Choose artwork that’s about two-thirds as wide as your sofa (if you’re clustering pieces, this would refer to the overall dimension), and hangs roughly 8-10 inches above the back of your sofa. That way the size of the artwork isn’t competing with the size of the sofa, and everything is in great proportion. It’s important for any clustered artwork to have an anchor piece – like a console or settee. That will help to set the dimension of the display. If you’re using the entire wall for display, use the placement of larger pieces and bolder colors to create balance. Think about finding a rug that spans close to 60 percent of your room (leaving about 2 feet parameter around the edge of the room), so that it lays easily under your furniture. It’s a great way to distinguish your furniture groupings. A general rule of thumb is that eighty-six inches is an ideal height (it hides the bulb whether you’re sitting or standing). Think about using a floor lamp on one side of your sofa, and a table lap on the other. It offers balance without feeling too formal. It’s always fun to play around with patterns, and mixing them is easier than you might think. First, stick to one standout pattern per room, designating the boldest pattern to one of the room’s component pieces – walls, sofa, or rug. Then bring in two or three smaller patterns that carryover a similar color palette. I love the idea of mixing more organic prints with something geometric. A great way to add some grandeur to your dining room sideboard is by adding a mirror. Hang it about four inches above the top of the sideboard, and be sure to keep about six inches on each side. Always remember that drapery panels should skim the floor, not hover above. They should have about a half-inch break, or you can keep about two to three inches for puddling and volume. Generally, sconces should be mounted on the wall about five feet above the floor (Now, I’m talking in places like the dining room, here… they would be a bit lower if you were using them as bedside light.). If you’re putting them over a piece of furniture like a console or a buffet, leave three to six inches of space between the sconce and the edge of the mirror/art that it’s flanking. 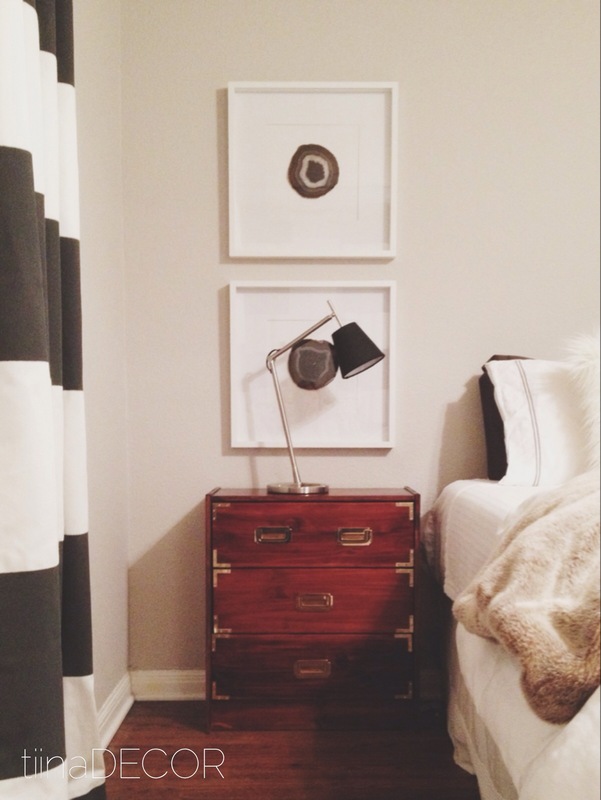 Artwork is a great way to refine your space, and incorporate your personality. Think about utilizing the space on the wall behind your bed. There are two different “zones” to take advantage of. First, the space right above your headboard is perfect for showcasing multiple pieces (think clusters) or even one large showpiece. Just be conscious of proportion to the overall space. We still want to keep the whole look in balance. Second, is the space above your nightstands. I love the idea of stacking artwork vertically. Again, just be sure that the overall visual is balanced with the center headboard. A great way to create a cohesive color scheme is to follow this general rule of thumb: Choose one color for 60 percent of the room, and use two accent colors (15 percent each), and a final color – maybe one that’s brighter than all the others – to add some “pop”. Thanks, Skylar!! I can hardly believe it myself! Can’t wait to celebrate. I love all of these rooms, tips, and tricks!! I’m working in brainstorming some ideas to give my master bedroom a face lift. This is great inspiration. Thank you! !